I don’t know about you but I can’t think of anything more nourishing and soul-satisfying than a creamy, rich cup of homemade eggnog during the holidays. 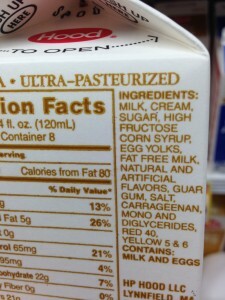 Mmmmm, nothing says eggnog like a little Red 40 and Yellow 5 & 6, right? Throw in a little guar gum, some carageenan, high fructose corn syrup and mono and diglycerides and boy oh boy… just like Grandma used to make! That’s Hood brand eggnog. They seem to have a monopoly on the eggnog in supermarkets around here. Needless to say, they’re about as far away from homemade eggnog as it gets. 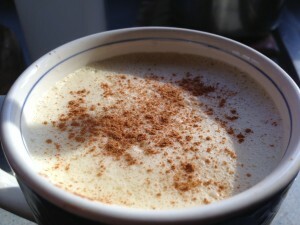 So when my friend shared with me his homemade eggnog recipe, I knew I had to try it. But it sounded almost too simple. So I asked Lord Google for some variations. Of the 26,900,000 search results, the ones I read involved varying degrees of whisking, heating, mixing, thickening and thus…time. One site declared it would take at least an hour. So I said screw it. I decided to just try my friends’ super simple recipe. It was the most delicious eggnog I’ve ever had. And it took me all of about five minutes. 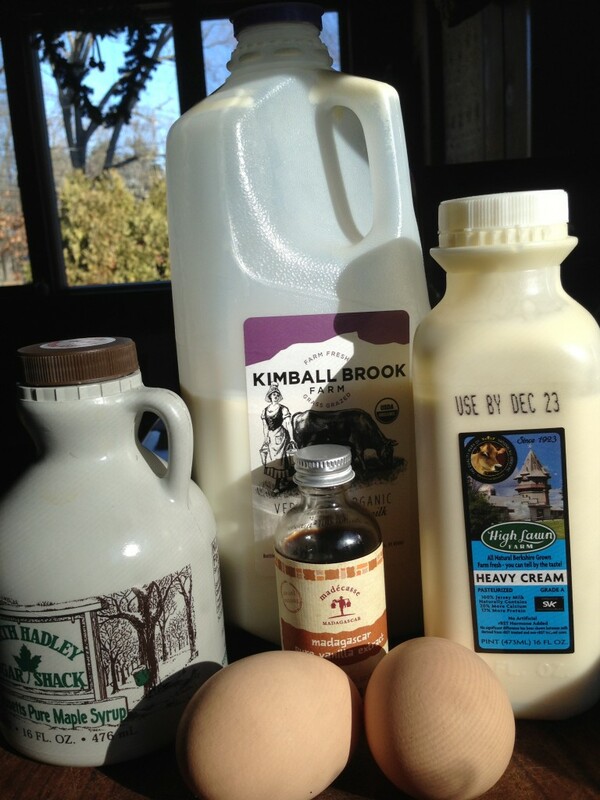 Whole milk, heavy cream, egg yolks, vanilla extract and maple syrup. That’s it! Spices like cinnamon, nutmeg and cloves can also be added. Add some rum, bourbon or any liqueur of your choice for an adult version. Ideally you want raw milk and cream but if you can’t access it, get the best quality dairy you can in stores. Look for organic, grass-fed and non-homogenized milk and cream. Put all ingredients in blender and blend for 20-30 seconds. That’s it! A nice froth will form on the top which adds a nice finishing touch. 2 TBSPs of maple syrup is just perfect for me. Add more if you want it really sweet. 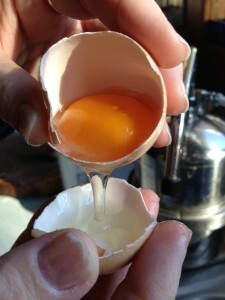 Crack the eggs and pour off the egg white into the other half of the shell. 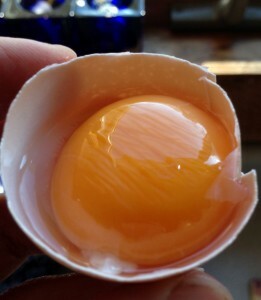 I spent years butchering egg yolks by trying to do this with a fork or spoon before I learned this simple time-saving tip. Save the egg whites! They freeze very well and can be used in many baking recipes. Some crunchy-minded folks use them for skin and hair care as well. Look at the gorgeous, deep orange color. I get these beauties every week at my local farmers market. And that beautiful, rich color is what will give your eggnog it’s characteristic yellow color. 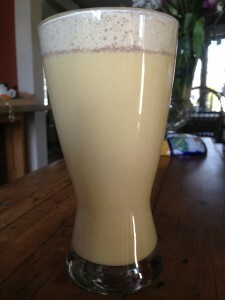 Notice the nice frothy top. Top it off with a little cinnamon for a perfect finish. Or serve in your favorite holiday mug. 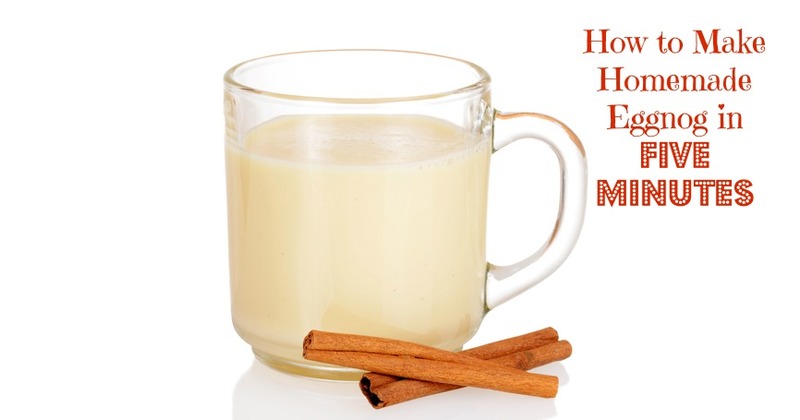 Homemade eggnog in five minutes.